How can manufacturing simulation software be used to improve alignment and cohesion between manufacturers and system integrators? There’s no question the manufacturing industry is in the midst of a renaissance. Complete with leaps and bounds of enabling technologies fundamentally disrupting the status quo, the new renaissance is forging seismic and dynamic shifts in the space. But there is another, concurrent revolution happening within manufacturing beyond technology, and that is of the manufacturer mindset and, more specifically, the factory paradigm itself; the lens through which manufacturers plan, design and operate the shop floor. This revolution is profound in its simplicity and can be summed up in one word: cohesion. According to a recent survey conducted by LNS Research, the top two operational challenges facing its Manufacturing Operations Management survey respondents were a lack of collaboration across different departments and disparate systems and data sources, respectively.1 This is especially problematic for modern factories, which strive to be responsive and flexible to market needs, while maximizing productivity and profit. In order to succeed in the 21st century, manufacturing planners need their factories to be integrated and cohesive with their supply chain, product development and other organizational assets. This requires system integrators to become more sensitive to how their solutions impact this cohesion, and manufacturing planners to improve the way in which they communicate and collaborate with all stakeholders involved in the planning process. In order to succeed in the 21st century, manufacturing planners need their factories to be integrated and cohesive with their supply chain, product development and other organizational assets. Fortunately, there are tools to get “everyone on the same page”, creating a catalytic effect on team communication and shortening implementation cycles. One of the most effective of these tools is visualization. Visualization, commonly defined as “the study of visual representations of abstract data to reinforce human cognition”, has been a part of manufacturing planning since the dawn of the last industrial revolution. Visual aids such as drawings, blueprints and photographs and, later, CAD drawings and 3D renderings; are forms of visualization that manufacturing planners and system integrators have used for decades to communicate manufacturing design concepts. Over the last several years, visualization technology has coalesced with simulation technology and the Internet, evolving into 3D manufacturing simulation technology. 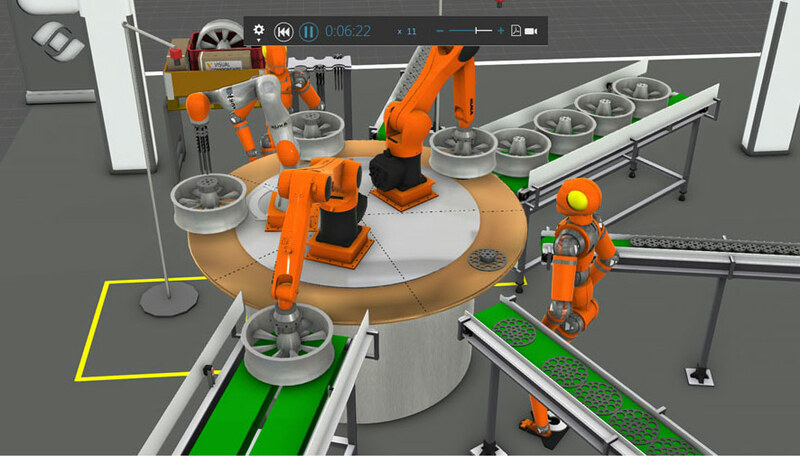 This technology integrates disparate sources of input data, such as CAD geometries and programming logic; and, using manufacturing specific simulation behaviors, creates accurate simulations and visual representations of those inputs. In a nutshell, it helps planning teams to visualize their factory environment and the impact of their decisions on manufacturing design and performance, with engineering-grade accuracy. This is big for two reasons – it reduces the risk of design errors and oversights, and empowers more stakeholders to participate in the planning process. Consider the following scenario (taken from a real-world experience) in which an integrator’s client factory missed delivery of goods and lost more than $1M on a project due to a slight miscalculation (omission, actually) in an Excel planning file. This miscalculation, when accounted for properly and scaled across the entire production, implied a significant reduction in throughput. So, one piece of the planning toolkit (in this case, an ordinary spreadsheet) threw everything off in its inability to accurately account for a spatial nuance that, while nearly impossible to capture in Excel, would have been obvious to the planners had they been using a 3D manufacturing simulation tool. What does that mean? In short, it means that system integrators and manufacturing planners who employ comprehensive visualization in their planning process reduce the risk of making mistakes and oversights that can have significant downstream effects. When system integrators and planners rely on a combination of disjointed tools in only certain steps of the process, important information and key details can be easily missed or left out, such as spatial irregularities across different robots and stations, or caveats and nuances in processes. 3D manufacturing simulation technology integrates disparate data sources and helps planning teams to visualize the impacts of their design decisions, so they catch mistakes and oversights before they become operational hazards. System integrators and manufacturing planners who employ comprehensive visualization in their planning process reduce the risk of making mistakes and oversights that can have significant downstream effects. Perhaps the greatest benefit of visualization is how it improves collaboration and communication throughout the planning process. The manufacturing planning process for 21st century manufacturers has grown much more complex. It involves a breadth of stakeholders, from the sales team and layout planners on the integrator side to controls engineers and financial analysts on the manufacturer’s side – all with differing degrees of knowledge and input in the process. Modern visualization technology is an invaluable tool for these stakeholder groups to quickly understand all the moving parts and visualize the impact of their decisions on the manufacturing design and performance. This insight improves collaboration and allows everyone – from the finance team to the manufacturing engineers – to more effectively participate in the process. In the race toward cohesion as an integral theme of Industry 4.0 and the so-called Digital Thread – technologies that enable a single, bi-directional flow of digitized information across the value chain – comprehensive visualization is essential for system integrators and manufacturing planners to get ahead. 1. LNS Research. “Manufacturing Operations Management Survey …” N.p., 2013. Web. 20 Oct. 2016. In this article we’ll explore other industries using visualization, with an eye on common benefits that can be used in manufacturing design and planning. In this article, we’ll review the importance of using valid production data for labor and staffing and capital investment decisions. Simulation vs. Visualization – what’s the difference? In this article, we’ll explain what simulation and visualization technologies are, why they’re helpful in the context of manufacturing, and how they complement each other.